With our handy free printable template, you can make as many desk containers as you need, why not make one for yourself and one for Dad as a useful Father’s day gift! 1. Print your free template out. The template is not to scale but we have included the correct measurements to create the desk tidies pictured. 2. To create your large container, score and cut a piece of kraft card following the large container guidelines to create two side panels. Repeat this again to make the other two side panels, including the bottom panels for both. Join the side panels together and stick the bottom panels together to create the base for your desk tidy. 3. We have used contrasting paper from the Dovecraft Back to Basics True Blue paper pack to cover each side of the desk tidy. We have cut the paper to give a small allowance to create a framed effect with the patterned paper and kraft card. 4. To make a base for your desk tidies, cut a 16.5cm x 12cm rectangle using the kraft paper. Cover your base in a coordinating patterned paper. Stick your desk tidies to the base using double sided tape. 5. To decorate our desk tidy, we have added three enamel dots in order of size to the small desk tidy container and three coordinating True Blue buttons to the wide container. 6. If you want to make a medium container, add 5cm to the height of the back panel and 0.5cm to the height of the front panel following the dimensions of the small container template. 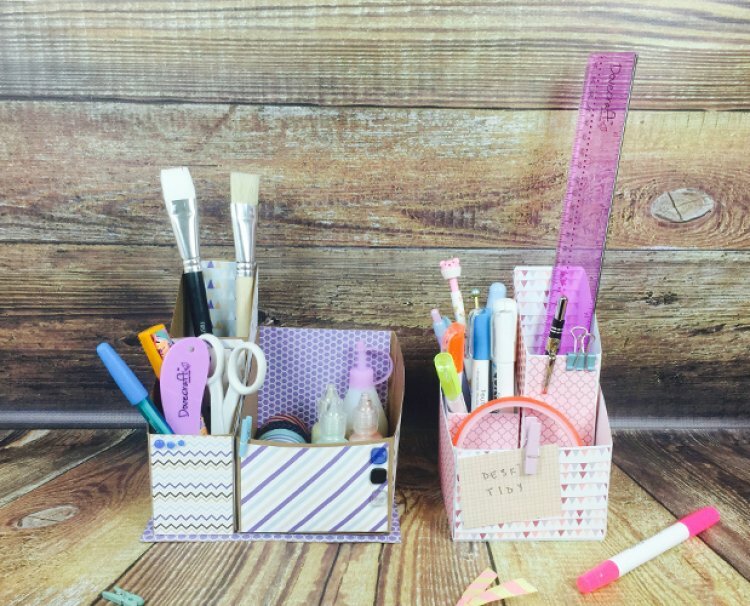 Following the free printable template, we also made this cute desk tidy using the Dovecraft Back to Basics Pretty in Pink paper pack. We cut a piece of patterned paper by 6.5cm x 5.2cm and attached it to the desk tidy with a mini peg, great for adding text, reminders or motivation quotes to get you through the day! The great thing about this desk tidy is you can mix and match the design, the smaller boxes fit perfectly inside the larger box. For an organiser with more room add extra boxes on both sides. We can’t wait to see your crafty makes in our project gallery.